The medieval era sees the Vikings make way for feudal warriors, but there are still those who follow the old ways. These wild and hardy warriors live for battle, whether it be with an army or a smaller raiding force. 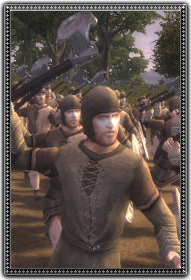 Armed with an axe and light armour, these hard men from the north are an intimidating prospect on the battlefield.